London’s Trafalgar Square holds a rather central spot in the festival seasons of the city. 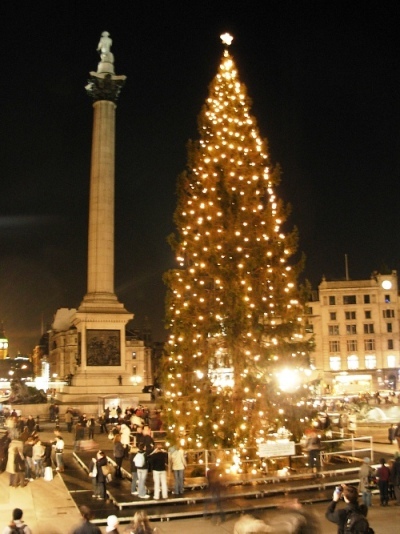 Early in December, as it has since 1947, it again played host to a towering conifer gifted to the people of Britain by the city of Oslo, Norway, in appreciation for their help during World War II. With some press announcement about the tree fresh in my head, I left London to attend the Anthropological Association in America, held this year in Washington D.C. There, by matter of course, I happened upon an other Norwegian Christmas Tree, this one tucked in corner near the Metro entrance (the West Carriage Porch, to be exact) of Union Station. This one is given by the people of Norway to the United States as a gift of appreciation for the assistance given to Norway during and after World War II, a long established tradition going back, the Union Station says, to 1996. Oslo also gives trees annually to Reykjavik and Rotterdam (though this year they did consider ending the tradition for budget reasons), I do not know if the the people of Norway give trees to any other nations—my scattered searches online found nothing (beyond speaking to the popularity of Norwegian Spruce); but the magnitude of nations giving to nations and cities to cities is considerably at odds with the typical Christmas Tree scene. In the movies you go to snow covered hill sides with your saw and bag yourself a big one. But more likely, it is the Turkish Grocer on High Street, or – as I saw in D.C. – the abandoned ground floor warehouse-turned-into-tree-farm from which many holidayers will have purchased their pre-cut tree. I have conducted research for a number of years among Eastern Orthodox Christians, and in the communities which use English as a lingua franca (among whom most of my work is done), ‘old country’ traditions are continuously being placed beside each other on the table. Borscht and baclava have never been such natural compliments. Following the Orthodox Christian Calendar (now this is confusing, as there are actually two), there is a period of fasting (40 days) which leads up to the Feast of the Nativity of Our Lord (aka Christmas). This fast begins on 15 November (28 November on the ‘Old Calendar’). Within these 40 days of fasting and preparation, however, there are various feasts. St Nicholas, for example, is celebrated on 6 December. Many households leave their shoes out in a neat row, often in front of his icon where he can find them, and he leaves various things like chocolate coins or—what in wider Anglophonic Christmas practice—might be called ‘stalking stuffers’. One saint commemorated in this period—and I promise, dear reader, this returns us to Christmas Trees—is St Boniface of Crediton and Germany. Born as Winfryth of Crediton, in Devon, England, around 672, this English monk was sent by Pope Gregory II to evangelise the Germanic peoples. And here, we return to trees. There are various accounts, with varying levels of heroism (a young girl may have been saved from sacrificial death), evangelism (there may have been a sermon about Christ dying on a tree), magic-realism (the deathblow may have come from the sky), but suffice it to say: Boniface fell Donar’s Oak. This oak, alternatively known as Thor’s or Jove’s Oak, was a sacred tree of particular importance to the Germanic pagans. St Boniface of Germany, along with his namesake St Boniface of Rome, is commemorated on 19 December by many Orthodox Christians (many also mark the feast of his martyrdom on 5 June, when he was stabbed in the head by some angry Friesians). On the 20th, a stricter period of fasting begins in the final lead-up to the Feast. As such, the 19th marks a transition point for some people, offering a point to purchase a tree and begin to prepare the house for Christmas decorations — which often are not out in full till Christmas Eve. One of the things credited to St Boniface in felling the Donar Oak is that it is his sermon given on the occasion of felling the oak that paved the way for Christmas trees. As I was told the account, he explained to the German tribes that Christ, having already died on a tree, made is so that human sacrifices no longer needed to be made on such trees (remember there may have been some heroism saving a young girl). As such, the symbolic link between the coming of Christ (either in evangelism or nativity) and a tree becomes rich with possibilities. There is a marked shift from the missionisation of Germany and felling of a Pagan Oak to the good-will gifts of one Scandanavian people to those who have helped them in past wars; but the nice thing about trees as symbols is they can grow. Another outgrowth of Christmas trees came to my attention while in DC, too. This however, not in Europe or the US, nor with oaks nor conifers. Jose Miguel Sokoloff gave a TED Talk in October of this year, addressing the topic of Christmas lights, ad campaigns, and war in Colombia. With the ongoing civil war running well over 50 years, he, as he says, has never known a single day of peace in all his life. And while peace may still be a ways off, it is looking better now than it has in a while. If Christmas can come to the jungle, you can come home. Sokoloff ends the TED Talk addressing the role of advertisement as an agent of social change. Using things like fairy lights to decorate trees in the South American jungle sits as an odd counterweight to the Christmas Tree tucked in a corner of Union Station. But the breadth of comparison does bring to the fore something interesting. Whatever their history, Christmas trees carry a curious ability to help bring peace in Colombia and goodwill from Norway.